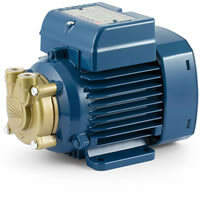 THE HYDRAULIC PERFORMANCE OF THIS STURDY AND COMPACT BRASS PUMP MAKES THEM IDEALLY SUITED FOR TRANSFERRING LIQUIDS IN THE MECHANICAL PROCESSING SECTOR, FOR CONTROLLING THE TEMPERATURE OF MOULDS, COOLING, CONDITIONING AND FOR BEVERAGE DISPENSING MACHINES. This particularly compact pump reaches high performances from very low motor powers and is therefore suitable for cooling welding torches. Anti-seize, brass pump head suitable for industrial use.